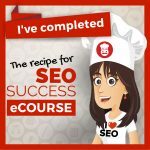 This is a review of Kate Toon’s Recipe for SEO Success e-course. And just for fun, I’m pretending I’m a famous business coach on stage at ProBlogger. Darren Rowse is asking me the questions. Darren: Kate, you’re awesome. Why did you need an SEO course? I became a copywriter because I loved writing. I specialise in websites because I thought that was a great angle, not because I had plenty of experience writing websites. I taught myself SEO and I had some coaching from my cousin-in-law Emily Hill from Write My Site. So that was enough for a few years. 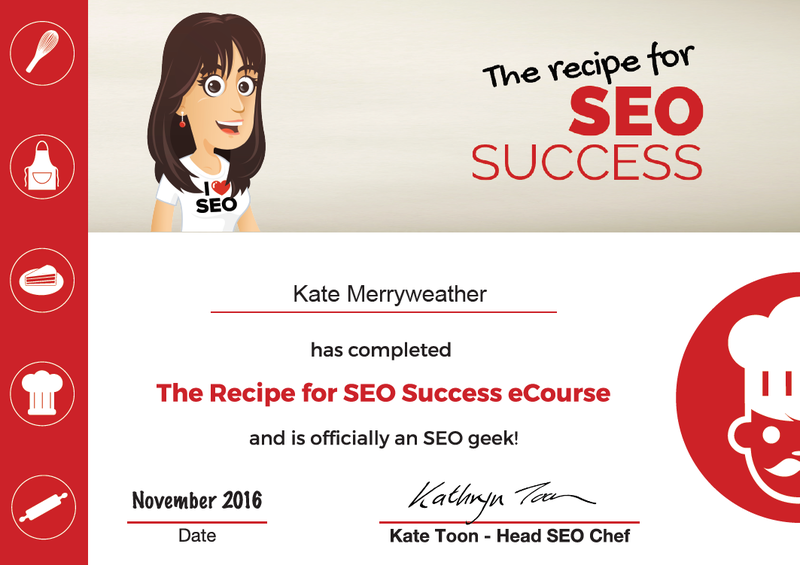 But when I saw Kate Toon’s Recipe for SEO Success e-Course I decided it was time to brush up on my skills. Darren: What made you sign up to this course ? Me: Because Kate is a copywriter like me, she has the same name as me – we’re practically twins. Plus, she has managed to get herself to page one for single word terms like copywriter. And a zillion other words. She knows what she’s doing. I never considered any other courses, to be honest. I’d been lurking around Kate like an underage teen trying to get the courage to approach the bouncers for entry into a bar. What got me over the line was Kate’s threat promise that this would be the last e-course for this year and the last for this price. Darren: What’s in the course? Me: Heaps! Kate has structured this really well. The sequence of subjects is logical and easy to follow. The resources alone she shares are worth the course fee – it’s comforting to know you’re using a tool trusted by the experts. Kate is just so jolly helpful during the weekly coaching calls. I enjoyed her answers to questions from others in my group. She knows it all. The e-course covers everything from techy stuff, copywriting, links, promotion, keywords and much more. It really is comprehensive. There’s a wonderfully exclusive Facebook group too where current and former students share tips, wins, and Kate actually participates in the group very regularly, unlike other groups I have joined where the leader is conspicuously absent. Darren: How did you go with it? Me: As soon as I signed up I allocated three hours a week to studying the content and getting value for my investment. I then promptly won several new jobs, and the agency I worked for increased my hours as well. So I found myself quickly slipping behind. But luckily, the course gives me lifetime access so I can go through it at my own pace. Darren: What did you get from the course? Me: It’s certainly given me confidence in my SEO skills and knowledge, and helped me give better advice to clients. Even the small changes I have implemented have helped me improve my own website rankings. Actually, I’m happy with the rate of business I’m getting at the moment so I’m not too bothered about getting myself any higher at the moment. Darren: Anything you didn’t like? Me: I struggled with the coaching calls in the 5pm timeslot, otherwise known as hell hour in my house with three young urchins going nuts and me sipping wine out of a mug just to get through it. But the coaching calls are recorded so students who can’t attend can watch them later. I understand that 5pm is a good timeslot for other students who live in different time zones, so it didn’t bother me too much. Darren: Would you recommend this course? 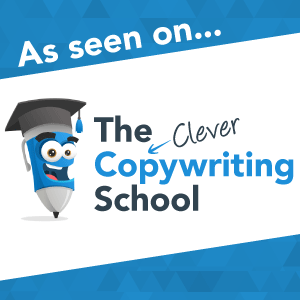 Me: If you are a copywriter this course is an absolute must. If you are a small business owner this course is an absolute must. Get in quick, because Kate is increasing the course fees next year. Who knows how often she will offer it in 2017? As more and more people become aware of Kate and her Toontasticness, demand for her e-course will certainly increase. So get in quick! If you’d like to check out the course, here is the link: Kate Toon’s Recipe for SEO Success I’m an affiliate, so if you choose to sign up, I get a little bonus, but you don’t pay any extra.